Google is slowly adopting elements of the business intelligence world. Today it's a competitor to Yahoo Finance called Google Finance with features like zoomable time period charts, headlines linked to charts, etc. Just recently Google bought Measure Map. What's Measure Map? 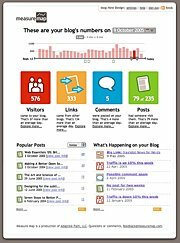 A dashboard for blogs. No more mucking around with crufty clickstream log analysis software to get at the data points important for a blog. A neat idea and worthy addition to Google since it matches up with Blogger. I've used Blogger for three years and I really like its ease of use.